Brushes are the most important tool inside of your face painting kit besides your paint. Finding the perfect brushes may seem like finding a needle in a hay stack. 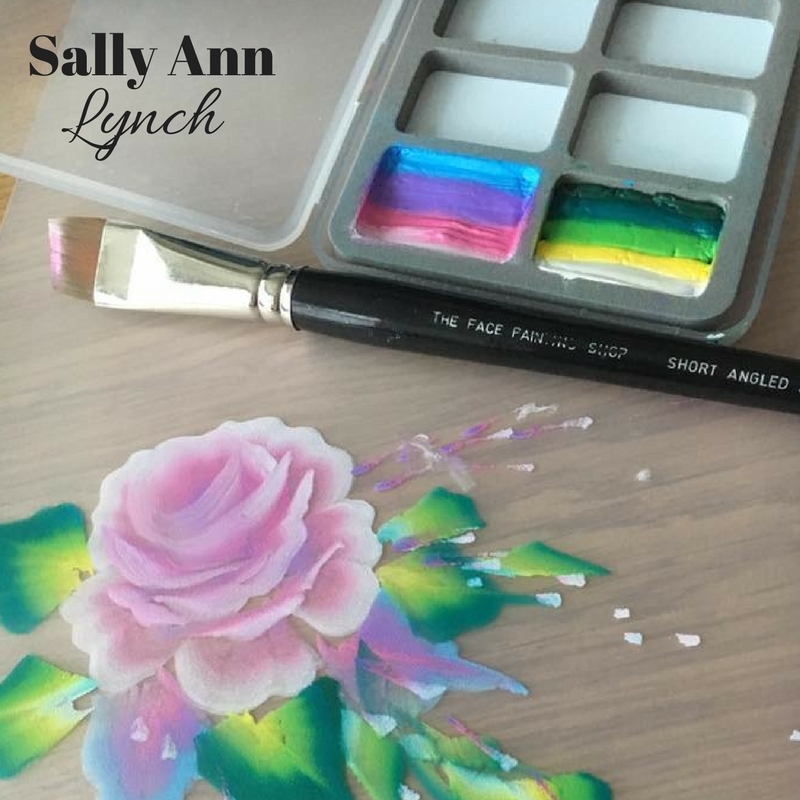 Yet, once you become familiar with the different brushes, their uses, and styles you will be able to pack your kit with the tools that will help you paint better and faster! Much like face paint, there are zillions of different brushes on the shelves of your local art store, and dozens to choose from in our Silly Farm shop too. 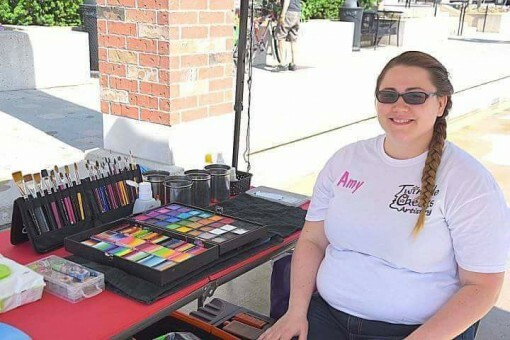 So what makes a brush better for face painting than acrylic painting? Can you use the same brushes? 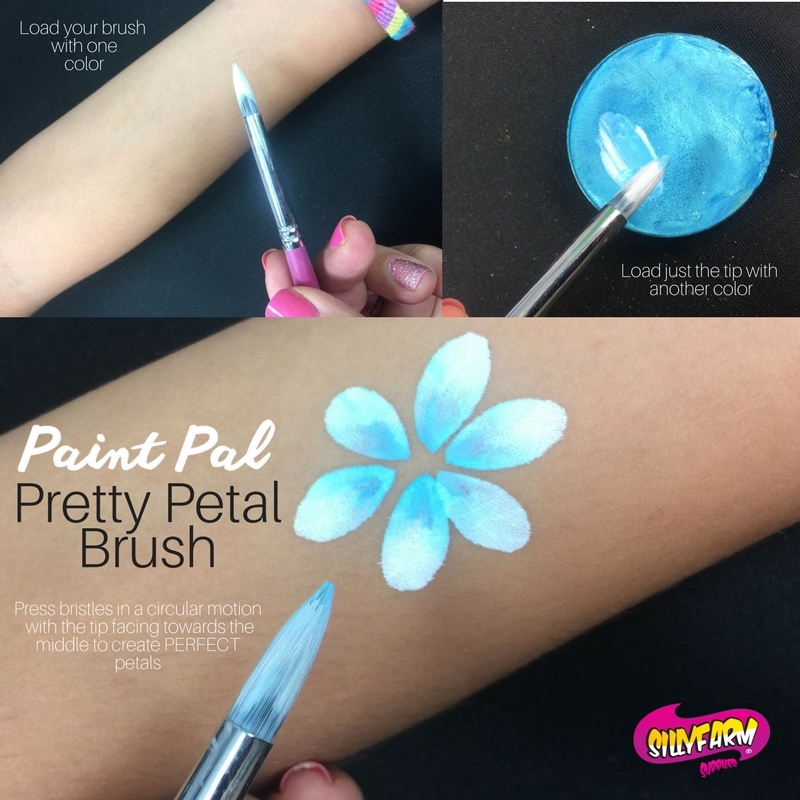 Is there a such thing as a face painting brush? I will answer these questions and lots more in this blog. After many years of testing different brushes, brands and hair types I have found that synthetic hair brushes are best for face painting. They hold up in repeated use in water without becoming too soft, they hold and distribute the paint evenly. And they keep their points longer than natural hair brushes. Sable brushes, or natural hair brushes are widely used with liquid paint ( all mediums) and with watercolor. The bristles are much softer and tend to clump when used with cake make up ( facepaint) because of the dense pigment. Some artists prefer a soft brush and enjoy the flexibility of a sable brush. Only you, know which brushes work best for your style and make up. You might have to test a few brands and hair styles until you find your go to brushes. So what is the difference between face painting brushes and art store brushes? Many times nothing. Art stores carry a large variety or sizes, styles and brands. At Silly Farm, I took the time to test several brands. I would leave the brushes soaking in water, test them with lots of paint, clean them vigorously, and test how they how long it would take before they would begin to fray. After that I was able to narrow down the brush selection and variety I offer. Because art stores do not specialize in face painting, it may be harder to locate the brush that works best with your paints among the thousands of brushes they carry. If you are familiar with a style and size of brush you like and can find them at your local craft store, that’s always a good thing too. Round brushes are the most commonly used brush by face painters. They are used for line work, swirls, curls and everything in between. Synthetic round brushes are the number one used brush by face painters around the world. Years ago, when I started testing and deciding on brushes to carry in the store I found the Loew Cornell 795 series. I fell in love. The bristles were strong, they held their point, and painted nicely on the skin. I named the brushes Gold Grip and for several years they have been our best seller. The hair is made out of a synthetic taklon and has a nice snap to the bristles. Other popular brands include the Majestic series, Mark Reid brushes, Paradise brushes and Royal Aqualon brushes. 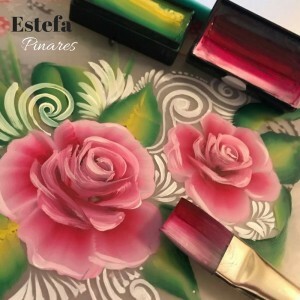 Last year I decided to work on my own brush line and I created the Paint Pal brush collection. I wanted to create a line of brushes that I had input as to how they were made. In 2015 I released the Paint Pail Swirl collection that featured Swirl 1,3,4,5 & 6. The number size of a brush usually determines its thickness and size. 0 being the smallest and 6-8 being the boldest of the round collections. One tip when looking for a good round brush, is to look closely at how the hairs are cut at the tip. Make sure they are cut evenly and that all the bristles join at the tip. If you do not have quality round brushes, it is going to make your face painting a lot harder. As face painters we work on a round angular surface and its important that our brushes move along our canvas with ease and not split apart. The most common Round brushes are 1,3 and 5 . 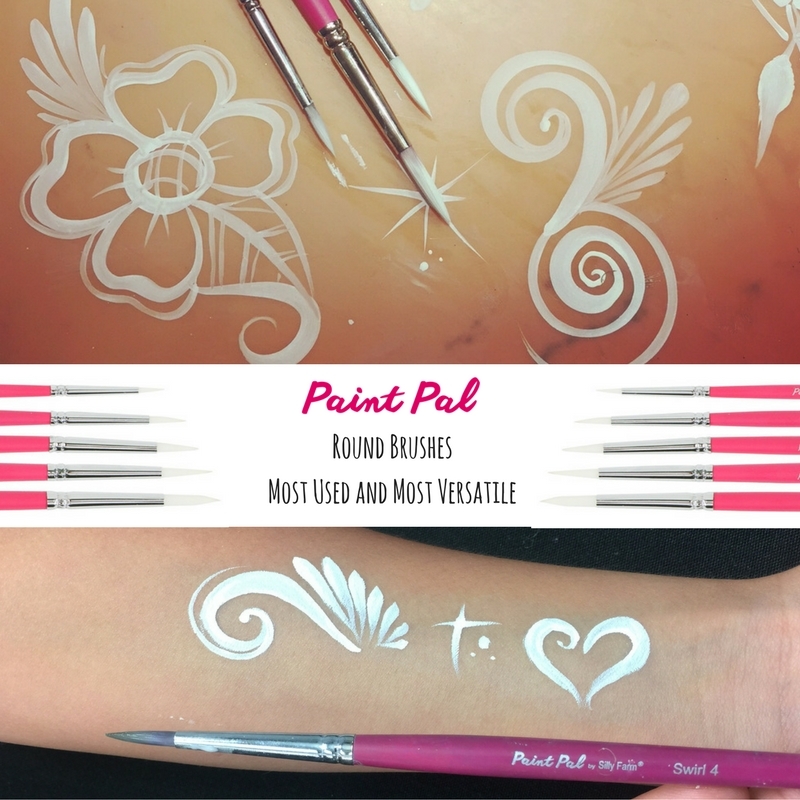 The #1 brushes are usually detail or liner brushes, the 3 and 5 are more versatile go to brushes used to create the outlines and framing of any face and body art design. Flat Brushes have always been used for stage make up and to cover larger areas when face painting. 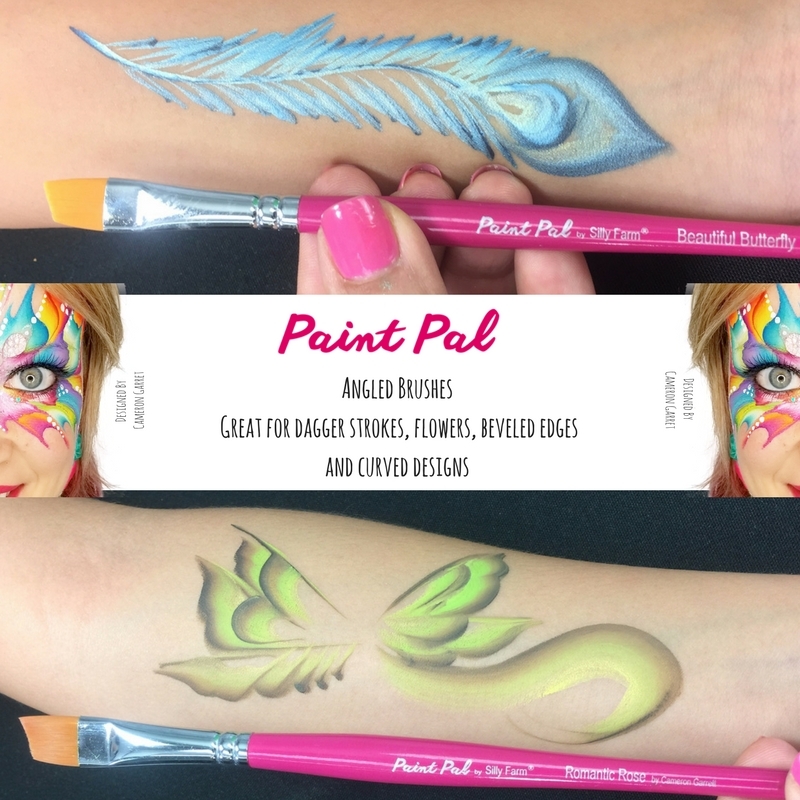 They became a must have for face painters after we launched the Arty Cakes. There are 2 sizes of flat brushes that are most commonly used. They are the 3/4 and 3/8 size brushes. Both are excellent to use with Arty and Split cakes. They fit perfectly inside of of the Arty Cakes and are a great size to work on the face. An important tip when deciding on Flat brushes. Look for a flat brush that tapers at the edge. If the brush has thick hair the majority of the paint will well up in the middle making it harder to disperse the paint evenly. A thinner edge also makes it easier to achieve One stroke techniques like the fan and U stroke. The thicker the brush, the harder it will be to work on the edge of the brush and blend one stroke colors. Flat brushes are available in a variety or sizes, widths and bristle length. Sally Ann Lynch the queen of roses, loves a short haired flat brush and the face painting shop created a special line of short haired flat brushes. Other artists prefer long haired flat brushes for easier blendability. 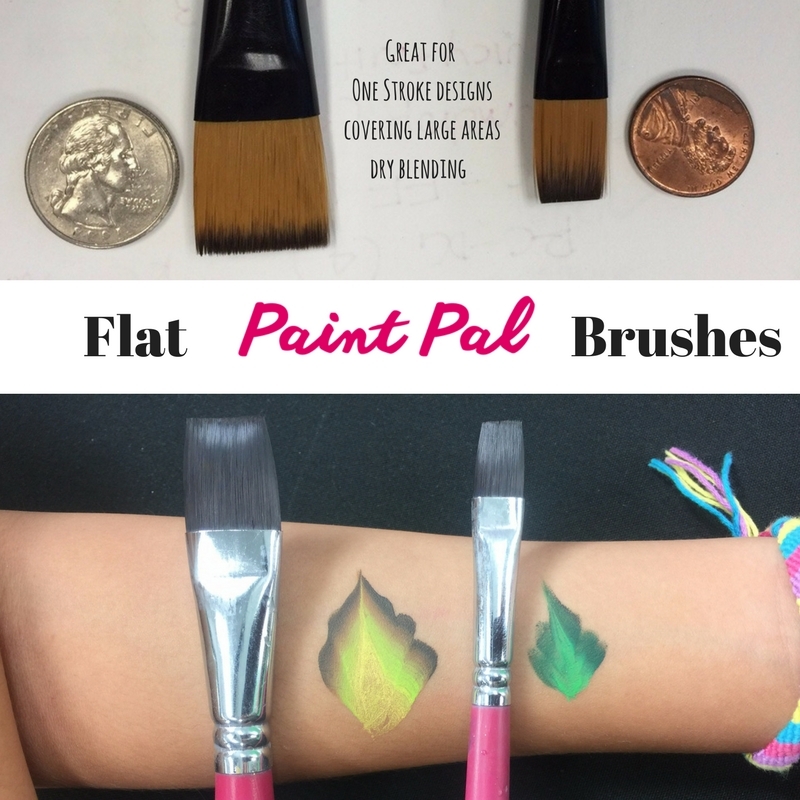 Here is a short video clip on the Paint Pal Arty Brush large 3/4 flat brush. Filbert brushes are my favorite brushes and I feel they are the most underrated. Chisel/ filbert brushes have a flat base with a round tip. They are excellent to get in the corners of the eyes. To make large bold tear drops, thicker lines, and to fill in larger areas. I crated 2 sizes of filbert brushes for those painters that like bold thick lines and control. Because of the round edge they also make excellent flower petals, perfect hearts, animal noses, and muzzles with ease. 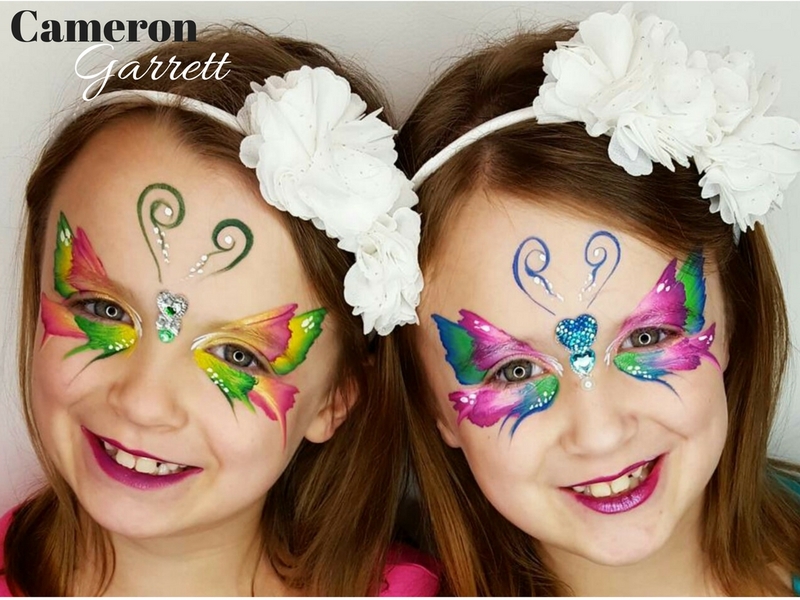 Beautifully blended and perfectly edged Butterflies are the newest rage in face painting. 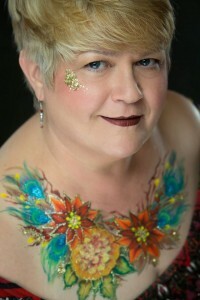 We drool over Denise Cold’s roses, we love everything Cameron Garrett paints, and we stare in amazement in how they create such amazing face and body art. The angle brush has been their secret weapon, which is why we worked together with Cameron Garrett to create her line of angled brushes. I must admit it took me a few ties to get used to the angle but ever since I am hooked. I love scalloped edges and how easy it is to create beveled butterfly edges. For tips and tricks on how to use angled brushes check out Denise Cold’s and Cameron’s classes on FABAtv. The variety of face painting brands has evolved over the last decade and so has the variety of brushes and tools. One of my favorite parts of my job is testing new products and finding tools to help speed up and improve are artwork. 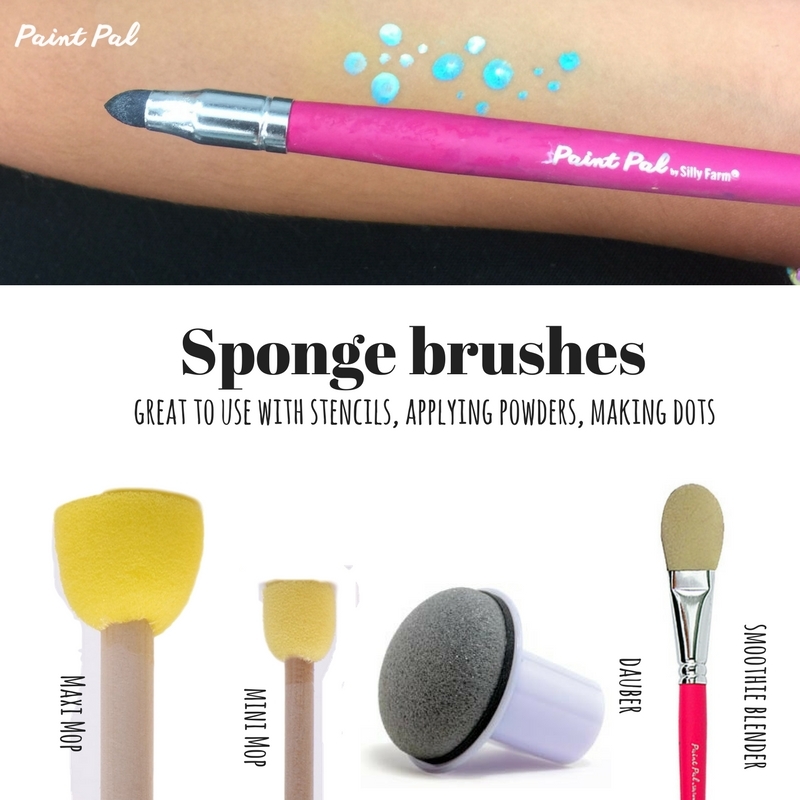 Sponge brushes are great tools to keep in your kit to create fast designs, to use with stencils and to apply powders. The Smoothie blender has been our number one selling brush for 4 years. It is a foam applicator brush used to apply powders like Starblends and Elisa Griffith powders. 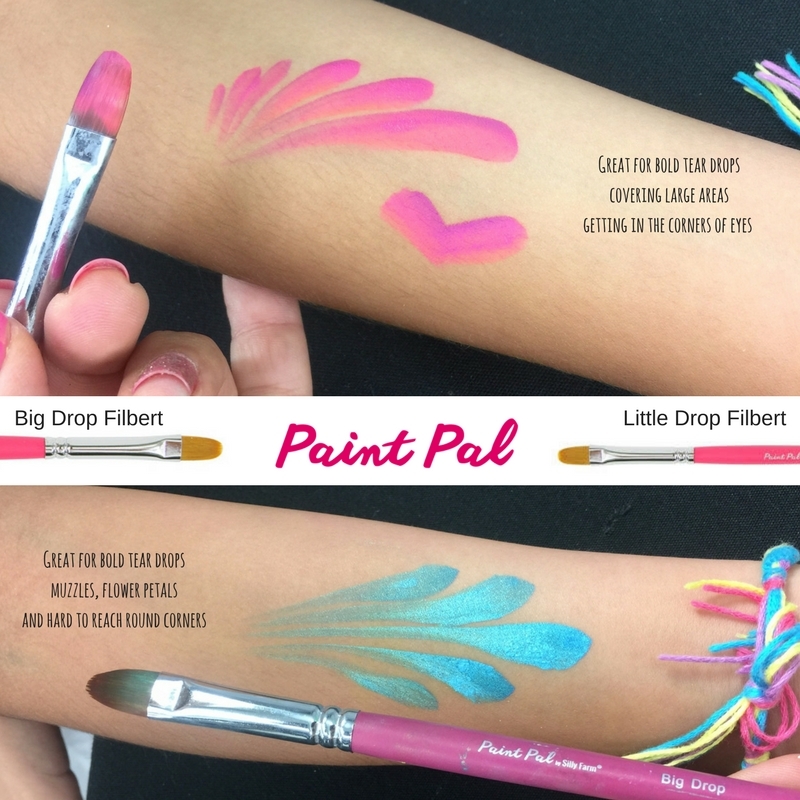 The soft foam tip makes it perfect for applying a smooth coat of powder and reaching those harder to reach areas. The daubers and mop brushes are great to use with your stencils. The finger daubers are the go to tool for artists when using smaller stencils like Tap and Graffiti Eye stencils. They let you control your placement of paint and keep your fingers clean. The round mops and daubers make the perfect round shapes when creating soccer balls, basketballs and round designs. When they are double loaded and then pressed on the skin they create the perfect shape and shadowing. 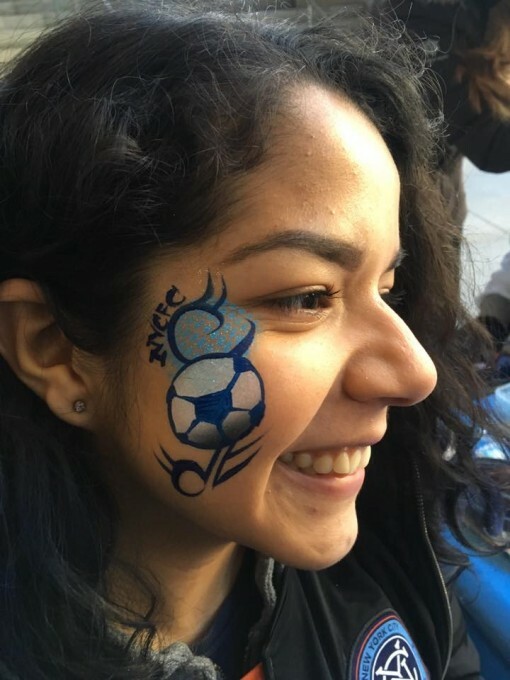 Melissa Munn of Face Art by Melissa NYC speeds up her soccer balls by using the Tsuneiko dauber and split cake the results are magical! Now that we covered a variety of different brushes its important to mention ways to take care of your brushes, keep them in great condition and how to store them. I love using my Brush Box it is a plastic box with grooves inside to hold your brushes in place. I like it because it keeps my brushes in position so that they don’t get bent or squished during transport. It protects them from damage and allows you to stack the box with your other supplies without ruining it. Another very popular brush holder is the Brush easel. It is very practical because it stores your brushes and it holds them while you face paint. Painters love the Brush Easel they can stand up all their brushes and show them off too! Amy Csordas is picture perfect at her gig and loving her brush easel! One of my personal favorite products and I think one of the most important tools to have in your kit is Brush Bath. 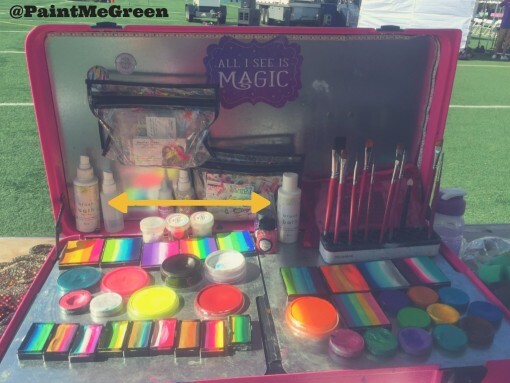 About 8 years ago I worked with a chemist to develop a product that you can use while you face paint to help keep your brushes and sponges clean, condition the bristles and is safe and organic. I use the Brush bath gel in my water while I face paint and use the spray to spray my brushes during and after the event. It helps keep the brushes sanitary and makes the parents feel at ease. 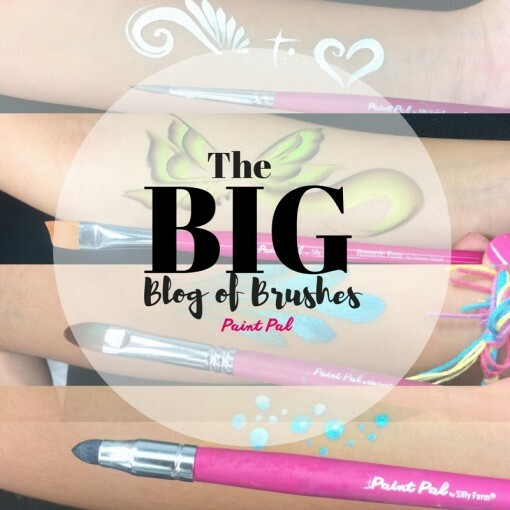 I hope this blog helped you narrow down what brushes you need and want to add to your kit. Our supplies are expensive and they all contribute to our bottom line. When I write these blogs, I write as a consumer hoping to help you save money and make the best possible purchasing decisions.